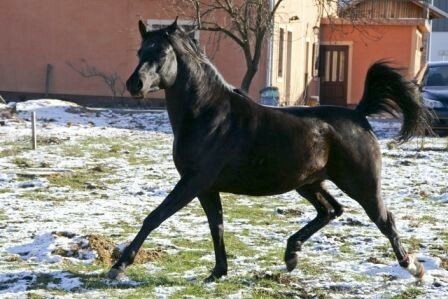 PASHA, Black stallion, *2008 (Kublaij El Gaug / Dolly). The Croatian Arabian Stud Book Authority is happy to announce that Croatia has awarded their 2010 WAHO Trophy. Since Croatia is a relatively new member in WAHO, we are always looking forward to awarding a purebred Arabian horse born in Croatia with the title of WAHO Trophy winner. The Croatian 2010 WAHO Trophy has been awarded to the black colt Pasha, bred and owned by Damir Jurkovic. Pasha was imported in utero to Croatia. He is by the Italian-bred stallion Kublaij El Gaug, a son of the well known black stallion Madallan-Madheen, one of the most influential stallions in Germany, who is of mainly Egyptian lines with the addition of domestic German and old Polish lines. 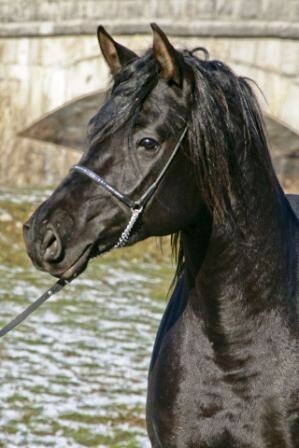 Pasha is out of the Hungarian-bred black mare Dolly, who is mostly of Russian pedigree with an added blend of well-known Egyptian and Weil-Marbach blood lines. At the Croatian Festival of Arabian horses in 2009, Pasha was awarded as the best in his class and we hope this success will follow him to future exhibitions and festivals. With his exotic black coat, good movement and type combined with his interesting international pedigree, we also hope he will become an influential sire in Croatia in the years to come.